Always read the instructions before using a cleaning product on your furniture and test in an inconspicuous area first. Do not place any indoor furniture in direct sunlight as this may cause fabric, leather and other materials to fade or crack. Direct sunlight includes sunlight through a window - use curtains or blinds to protect your furniture. If the air is too damp as in steamy kitchen, solid wood will still absorb moisture. Sticking drawers is a common warning sign. If the atmosphere is too dry as in a conservatory, wooden furniture may start to warp, twist and split. Joints may open up into unsightly gaps. Always lift furniture when moving it around the home and never drag. Dragging or pushing it will damage fixings and affect stability. You could scratch your floor, and strain yourself. When moving stone or travertine tables, always carry the tops on the vertical, never horizontally. Organize help before you start lifting. Rotate cushions regularly to even the wear and fading. Standing on a chair or rocking on the back of the chair may weaken the structure and possibly cause joint failure. The use of floor protectors on the bottom of furniture (such as tables and chairs) will minimize damage to floor coverings. Always use coasters, place mats, tablecloths and table runners to protect furniture surfaces. We especially recommend the use of good quality table mats with stone surfaces to protect the surface finish from hot plates and kitchenware. The stone we used is an all-natural material. Any variations in texture, colour and stone finish are inherent characteristics of a natural material and are part of the uniqueness that is the natural beauty of stone. 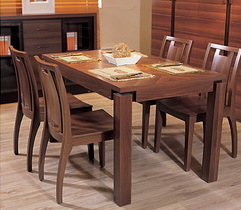 Wooden furniture is not water or chemical proof or heat resistant. Do not put hot dishes or cups on to any table top or cabinet. Always use an insulated mat for protection. Don’t use a protective cover containing rubber derivatives �C it could react with the top coat finish. Sharp objects such as cutlery and pens can score the surface of your furniture, as can crockery being dragged across the top. Do not overload wooden or glass shelves. Do not place heavy items on drop down leaves or doors. The hinges are not designed for excessive weight. Use a soft lint-free cloth to gently dust your furniture. Use a clean, very slightly damp cloth to remove finger marks. Unless you have bought a small item requiring some self assembly, please make sure that your room is ready and access clear for our delivery teams to man oeuvre your new furniture with ease. If you have wooden floors, please use a protective felt on the feet of your new furniture to prevent scratching. If you need to move anything after we have gone, find someone to help you lift and carry it. Please do not drag it across the floor. You could hurt yourself and damage your property. Once you have accepted the furniture and the packaging has been removed, take a few minutes to inspect it. Make sure you are completely satisfied before the delivery team leaves your premises. If your furniture appears out of line when it is assembled, check that the floor is level. You may need to contact specialists to adjust legs, feet or hinges to compensate and make it look right. This is more common on uncarpeted floors where there is nothing to cushion against the effect. If your wood furniture has a lacquered easy care finish, daily dusting and the occasional wipe over with a clean, damp cloth followed by a dry duster will keep it looking good. If your wood furniture has a waxed finish, use good quality natural beeswax and polish along the grain every 3 months. Use a clean duster to buff up and retain the natural beauty of your furniture. Never use abrasive cleaners - they will damage the lacquer. If your wood furniture has an oiled finish you will need to ‘feed’ it with linseed oil every 3-4 months. Do not let your furniture become too dry, but please avoid over treating the product. Always keep a cloth specially for your furniture, and ensure you do not touch it with soaps and detergents as these may damage the hand finished surface. Make sure you dispose of the cloths used safely. Wooden products change colour with exposure to both natural and electric light. Some like oak darken, others like cherry may lighten. Rotate any ornaments to avoid patches of colour where the object has stood. Leave dining tables fully extended if possible, or expose the leaves to light so there are no vast colour differences between them and the table top. This is especially important in the first year. Tablecloths, table runners and coasters help protect timber and timber veneer surfaces from scratching. Avoid placing hot or wet items directly on the surface as they can leave marks which are difficult to remove. Avoid direct sunlight, as this will cause colour change. If the furniture is positioned in direct sunlight, move items such as vases around to avoid spotting. Dust once a week using a soft cloth or similar duster. Avoid applying too much polish as this will build up and need to be removed with a wood-cleaning product. 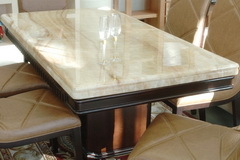 Caring for furniture made from stone or travertine is straight forward. Wipe any marks or spills with a slightly damp cloth and then polish with a soft dry cloth immediately. Use coasters under beverage glasses to avoid moisture rings. The stone on your table has been sealed, but it still requires regular cleaning. Occasionally wash marble surfaces with lukewarm water and wipe dry with a clean cloth. Wiping surface with a damp chamois will not leave streaks. Once or twice a year, depending on soil, wash with a mild detergent solution (hand dishwashing detergent and warm water), rinse and wipe dry. Never use vinegar, lemon juice or other cleaners containing acids, scouring powders or cream cleaners which may contain abrasives. Do not use petroleum solvents (which can break down and weaken the protective qualities of the sealer) to clean the stone top. Soap and water is all you need. If by mistake a solvent was used, and it has affected the sealer, after it is dry, simply add back more of the sealer to restore the finish. Handle with care. 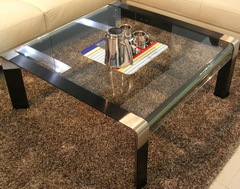 Glass is breakable, but when it is a furniture, guests won't think twice about setting a coffee mug or their keys on it. Use mats and coasters to protect glass from heat. Avoid using the glass as a chopping surfaces or allow sharp or hard objects come into contact with it. Always use decorative place mats under your vases or other ornamental items. Clean your glass table with non-caustic solutions only. A mild detergent, mixed with warm water is often enough, but if you need more cleaning power, add a small amount of ammonia to the solution. Buff with a soft cloth. Brushed cotton is fine, but the new micro-suede fabrics are even better. Make sure your cloth is clean each time you dry your table to prevent scratching. Clean with a recognized glass cleaner carefully following the instructions on the bottle. Do not apply glass cleaners to surrounding surfaces or to the frosted side of frosted glass. Place any frosted glass, frosted side down. Do not allow greasy or dirty items to come into contact with the frosted side. It can leave marks that are difficult to remove. Some minor marks can be removed with a cut, raw potato. Check in an inconspicuous area first. If glass is subjected to thermal or mechanical stress, it can be weakened and may break or shatter. Many Double One products come with tempered glass. Although up to four times stronger than normal glass it is not unbreakable and the same care must be applied. 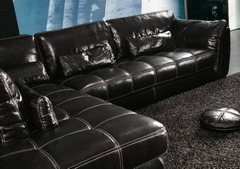 Leather is a natural product and variations in colour and texture are recognized as a feature. If you purchase a new sofa with a covering that is an identical article and/or is of the same colour as a sofa that you already own, it is possible that you may note slight differences in shades of colour between the two, because of the unique personality of each hide. Dirt and grime can act as abrasives on leather. Periodically wipe over the leather with a damp, soft, clean cloth weekly. And you can vacuum regularly with a soft upholstery attachment. For dry dirt: brush delicately using a brush with soft bristles or use a vacuum cleaner at the medium suction power setting, using the specific accessory supplied with the cleaner and taking care to avoid rubbing the accessory directly against the covering. For stains caused by substances soluble in water (soft drinks, coffee, tea, milk, marmalade): rapidly remove the liquid from the surface using a white, non-abrasive cloth (or absorbent paper). Then rub delicately working from the outside of the stain towards the centre, using a clean cloth soaked in water. Do not soak the leather surface, and dry immediately using a dry cloth. Do not dry the leather in direct sunlight or with a hair dryer. For stains caused by greasy substances oil, ketchup, mayonnaise, chocolate): Wipe excess ketchup, oil or grease off the leather with a clean 100% cotton white dry cloth. Then use a clean cloth, soaked in a very dilute solution of neutral soap, rubbing delicately working from the outside towards the centre of the stain. All this stains can permanently bond with the leather unless cleaned immediately. Body oils can oxidize and change the colour of the leather. Special care is also required if the user of the sofa is taking medication. For chewing gum: Place ice cubes in a plastic bag and apply on the chewing gum. Wait several minutes, lift the ice bag and remove the chewing gum. Position the sofa at least 50 cm from sources of heat such as heaters or radiators. Avoid placing the leather near direct light or heat sources as they can fade and damage the leather. In extreme climates you will need to moisturize the leather more often. Unapproved detergent substances may irreparably damage the leather covering, causing cracks and changes in colour. Clean it regularly but gently and apply a good quality vinyl dressing. To remove stubborn stains, you can use a soft bristled brush. For mildew, you can move up to a 4:1 water: ammonia solution, but be sure to spot test first and rinse thoroughly after. Minor scratches can be repaired with touch - up pens. Vinyl can tear on hard contact with a sharp implement. This can be remedied by smoothing the surface and re-attaching with PVA glue. Vinyl is heat sensitive so always place coasters or heat mats underneath hot food or drink containers. Avoid placing the fabric near direct sunlight or heat sources as they can fade and damage the fabric. Use window coverings (e.g. curtains and blinds) to protect your furniture from direct sunlight through windows. Please vacuum regularly with a soft upholstery attachment. Vacuuming will also remove grit that can also wear away the fabric. Where possible, rotate the cushions. Clean the fabric sparingly with a dry cleaning solvent that's water free. Test for colour fastness, use sparingly. Avoid over wetting. Depending on stain, use a water based solution, dry-cleaning solvent or upholstery shampoo. Fabric should be professionally cleaned only. Use a professional dry cleaning service at least once a year to maintain the appearance of the fabric. Furniture with removable covers must be cleaned while still on to minimize shrinking. Temporary pilling can occur on some fabrics. This is not considered a fault and can be removed using a de-pilling machine. Loose threads must be cut and not pulled. Arm caps will be suggested and will improve the longevity of your sofa. Rain, direct sunlight, and dew are damaging. Dry indoor heat dries wicker causing it to crackle and creak under pressure. Wiping occasionally with a damp (not wet) sponge may help. Wipe over with a damp cloth regularly to keep dust-free. Dust can cause the surface to pit. Powder coated finishes may be repaired using coloured or clear nail polish. To avoid in a damp or wet environment, it will cause the furniture corrosion. Chrome and stainless steel products can be cleaned with a dedicated metal cleaning product. These are available at most supermarkets. Vacuum regularly to eliminate dust. Flip and rotate the mattress regularly to use all sides, unless it is a no-turn mattress - then rotate only. This will increase the longevity of the product and will also air the mattress and reduce moisture build up. A good quality, washable mattress pad (and one for the foundation, too, if you like) is a must to keep your set fresh and free from stains. Avoid sitting on the sides of the mattress as it can create a weakness in that area. Bending or jumping on the mattress will also damage it. The chemicals in dry cleaning spot removers may be harmful to the fabric or underlying materials. Vacuuming is the only recommended cleaning method. But if you're determined to tackle a stain, use mild soap with cold water and apply lightly. Do not ever soak a mattress or foundation. Be sure to use a sturdy, high quality bed frame. If it's a queen or king size set, make sure your frame has the strong center support that will prevent bowing or breakage. Don't let the kids jump on your sleep set. Their rough-housing could do damage to the interior construction, as well as to themselves.